There was Axel...then Cage and NOW Beck! Check out my review Beck (Book #3 Corps Security) and blog tour giveaway! If you are looking for a interconnected standalone series with some hot alpha males and free of cliff hangers-- this is it! what I know I can’t have. So I did the only thing I know how to do. ARC kindly provided in exchange for a fair and honest review. Spoiler-free. I highly suggest reading this series in order to understand back story/relationships etc. I didn’t know what to expect when I picked up Beck. I read and enjoyed the other two books in this series and didn’t really “know” Dee. I knew that Beck was part of the hottie alpha security team and had a thing with Dee. The couple had a tumultuous relationship going on. Everything about their relationship came together in the third installment of this series. Man, I had NO idea what was going on in the background....no one did! Dee painted a picture of what she wanted everyone to see. No one realized the pain, depression and desperation she was going though. Happy and fun loving Dee didn’t really exist. Her best friends had NO idea that she was *thisclose* to going off the deep end. Only one person recognized her pain, saw through her bitchy/fake façade and took the time to love and help her any way he could. Beck was there ready to catch her every time…but would she fall too far down for Beck to pick her up? There was a lot going on in this action packed and steamy story. 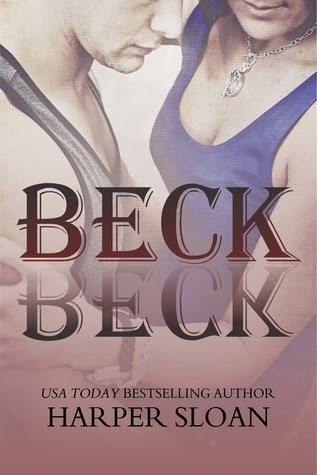 If you read Axel and Cage…you must check out Beck. This book does not end with a cliffhanger but it’s obvious the other Corps boys will have a story to tell. I am looking forward to checking out Locke and Cooper in books four and five! !